There are innumerable permutations when it comes to sour beer production. There are breweries that sour the wort, then ferment it with brewers yeast. Others ferment with brewers yeast, then sour it. Some breweries pitch all of the microbes together, while others stagger the various microbes over several months. There are breweries that pitch the same blend of microbes for every sour beer, while at the other extreme wild resident microbes in each barrel do the work. There are few instances where a souring technique is always either right or wrong, these are just variables that need to fit together. While I think Russian River and Cascade each produce some excellent sour beers, you couldn't take Russian River's microbes and Cascades process and produce beers as good as either of them does. At Modern Times we'll be doing some "quick" sours produces by souring the wort before a brewer's yeast (or 100% Brettanomyces) primary fermentation. The first will likely be Derek's recipe for sour-mashed cherry gose. However, this post is about our more "traditional" barrel-aged sour beers. We're still in the microbe and barrel acquisition phase, but the wheels are turning. Last week I wrote four recipes, making some adjustments on the advice of Matt, Alex, Derek, and Jacob. I'll post more specifics on each as they are brewed. Rather than simply buy a 30 bbl pitch of a microbe blend from a yeast lab for each batch, I've opted to grow a variety of cultures myself. A week ago I brewed the first 20 gallon microbe-starter batch. For that one I simply took a few old homebrew kits we had lying around the brewery, and added some pale malt to get the gravity up to 1.048. I pitched some American ale yeast to ensure a quick/healthy primary fermentation. The four carboys were dosed with White Labs Brett C, White Labs Belgian Sour Mix 1, BKyeast C1 Brett, and DCYeast DCY03 Brett(?). 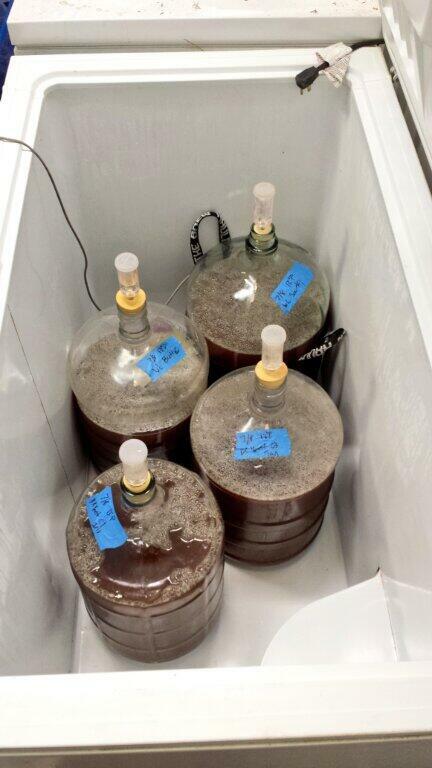 Later this week I'm expecting another 20+ cultures (from Saccharolicious, East Coast Yeast, and Nick)... I'll pick up the Wyeast Lambic and Roeselare blends as well. If anyone has other suggestions for microbes, send them my way! Some of those will be grown on wort from Lomaland (our saison) to free up the pilot system for more interesting batches. We'll also be starting cultures from bottle dregs (both commercial and homebrew). To make this easier, we ordered a pressure canner. This will allow us to always have small quantities of room temperature sterile wort on hand. That way we can grab microbes wherever we are. After the fermentation gets rolling, we'll step them up before pitching into a barrel. 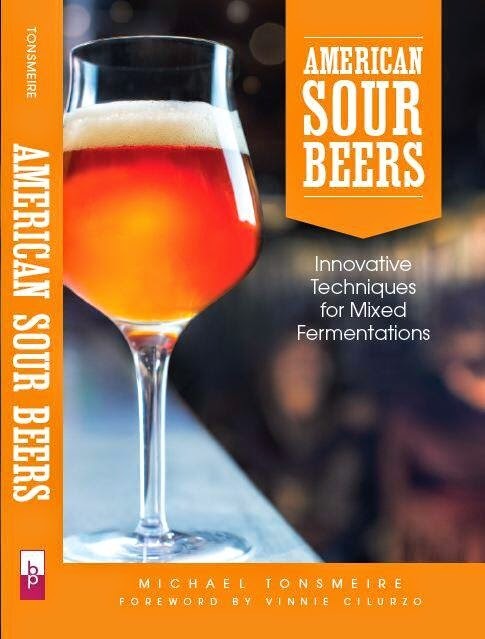 I'm specifically looking at American and Belgian beers fermented with cultures not easily available from a yeast lab (Jolly Pumpkin, Logsdon Seizoen Bretta, De Dolle Oerbier Special Reserva, gueuzes etc.). Ideally I'd rather we had six or nine months for all of these cultures to start showing their true characters. That way we'd have a better idea of what we're pitching and which beer it is best suited for. After a month it will be impossible to tell exactly what we've got our hands on. We certainly won't pitch anything that tastes really off (nail polish, vinegar, huge sulfur etc. ), but a Brett culture that tastes plasticy after a few weeks could be beautiful in a year. Luckily, using so many cultures we'll have lots of blending options. We'll also be mixing cultures, adding Lactobacillus and Pediococcus at the pure Brett cultures to ensure an adequate amount of acidity. When we actually brew the beers we'll be completing primary fermentation in oak barrels (as traditional lambic brewers do). Most likely we'll use our house saison blend. I like a brewer's yeast strain that imparts some character on its own, providing esters and phenols for the other microbes to work with. California Ale, would be the only other in-house option. I'm still debating whether to pitch the microbes at the same time as the primary yeast, or use the cultures to top-off the barrels after the initial surge of fermentation is complete. When fermenting in impermeable glass carboys or BetterBottles, I've found a mixed primary fermentation really helps to boost acid production, but in my experience it is less essential in barrels. Speaking of which, the plan is to use mostly wine barrels, although I wouldn't mind picking up some spirit barrels second hand from other breweries that have already run a clean beer or two through them. As with the microbes, I'd rather we had a wide variety of barrels to add further options for blending.We've talked to a couple barrel brokers, all I ask is that it's close enough that I can give the barrels a once over. Smelling them to knock out any with detectable off aromas. What did you settle on for a house saison blend? I heard Firestone Walker has a killer bsi drie strain that has a very aggressive lacto mixed in. Talk to sour Jim. Great dude who may be willing to help out. Also, I'll be in San Diego on Thursday. Will you guys be open? Would love to try some Modern Times! I have the other BKYeast strains, if you're interested (C2, C3, Berliner) and do not have them. I'm in Orange County, but could make an excuse to come down. I have some Brett blend from Al as well, but I'm assuming you have those on hand already. How are you going to store all those yeast samples after you have tested them? We're fermenting Lomaland with 95% Dupont, 5% Westmalle. Inspired by an article in Zymurgy! Really happy with the second batch, great yeast character, Matt kegged it earlier today. Thanks for the tip about Firestone Walker. We've got the BSI Brett Drie strain for our 100% Brett beers, suppose it should find its way into a barrel or two. Sadly we won't be open for a few weeks, but our beers are all over town. I've got the other two BKyeast strains as well, just haven't gotten them going yet. Any thoughts on them so far? I'm planning on running things the old fashion way. Barrels that make good beers will be propagated forward by using beer/slurry to get more barrels going. Barrels that do not will be given a long/hot rinse, and repitched with a "better" culture. In that way I hope to develop a number of house cultures. Some better for pale, dark, fruit etc. Anything with real potential for bottle conditioning or 100% fermentations will be banked by a lab until we get staff/equipment to be able to do it. I did small batches on the same base wort of all of the BKyeast bretts (as well as 5 other commercially available brett strains) and then did a taste taste with a few other friends. I took basic aroma/flavor notes from each of the taste testers. I'll get a blog post up soon with the findings on www.metabrewing.com, but the super short version is that C2 and C3 were the favorites. I have beers made with both Jolly Pumpkin and Logsdon Bretta dregs. I'll be coming to the backers party Sunday. Do you want me to bring them? By the way, we still need to do that Berliner Weisse tasting. I have a question for both Mike and Jeff, I recently brewed an all Brett Trois IPA inspired by the examples you guys have brewed. It has been over three months and my gravity is down to 1.0104. My question is: do I need to re-pitch yeast if I am bottling or is there enough Brett in there to carbonate the beers. I think we're all set with bottle dregs. I'd rather go directly to the source when I can. Thanks for the offer though! The Brett should be fine to carbonate the beer, although you might want to repitch to speed things along. Any reason you waited so long to bottle? I usually try to turn around 100% Brett IPAs in less than a month to prevent the hops from fading too much. I don't know, It hit about 1.020 right after primary fermentation was complete but I thought I needed the gravity lower (based on forums I read on HBT)before I could bottle or I risked making bombs. The flavors have faded a little but not much which surprised me since I used Belma, Citra, and Galaxy. I am dry hopping it right before bottling so I probably will use a little 05 to speed things along so I can try one before summer ends. Cool Mike. Probably better to get them fresh anyways. I find Brett Trois (Drie) to stay viable for quite a while. It always surprises how short of a lag time it has when I build up for a new batch. You might as well pitch some Sacc as cheap insurance. And definitely hit it with more hops before bottling. When you primary ferment sour beers in oak how long are you leaving it on the yeast? Do you ever rack to a second barrel? At Modern Times we do three days in stainless steel to avoid the mess of primary fermentation in barrels. Then the beers go into barrels and stay there until they are ready for blending and bottling. Lambic brewers often primary ferment in barrels and then leave it there for the long term. The Brett cleans up the autolytic compounds released by the dying Saccharomyces. I'd just suggest topping off after the initial blast of fermentation to avoid heavy oxidation. Could you possibly provide some details on " The first will likely be Derek's recipe for sour-mashed cherry gose"? any recipe of info about the grain bill? Hi Colin. Derek from Modern Times here. The grain bill was remarkably simple. It was 50% Pilsener Malt and 50% wheat malt. Half of the wort was left in the kettle and held at 121 degrees for 72 hours, and inoculated with a bag of crushed two-row. It was a very simple recipe.